Honor has introduced an entry-level smartphone in India which is priced at Rs 6,999. It’s called Honor Holly! 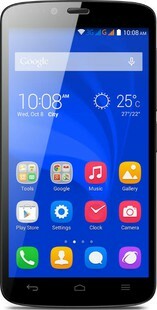 Talking about the Honor Holly Specifications, it packs a range of exciting features for a price tag it retails at. Starting with display, it has a 5-inches screen with 720 pixel resolution. There is a MediaTek Quad-core processor, which clocks at 1.3GHz. Accompanied by a 1GB RAM and 16GB internal storage, which can be expanded via microSD card slot. In the camera department, there is an 8MP rear camera, whereas there is a 2MP snapper for selfies. All this is powered by a 2000 mAh capacity battery. The device works on Android 4.4 Kitkat based custom interface. Honor Holly full specs and reviews as of Apr 2019. Buy it here!